Remote control incl. There is a nice black remote control in the scope of delivery. 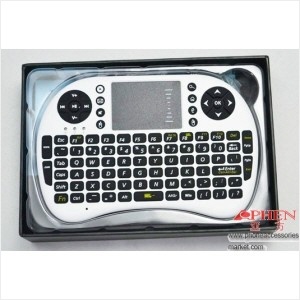 With this remote control you can use ALL functions and enter short texts (web addresses, passwords). We recommend these mice very much, absolutely with a wheel. 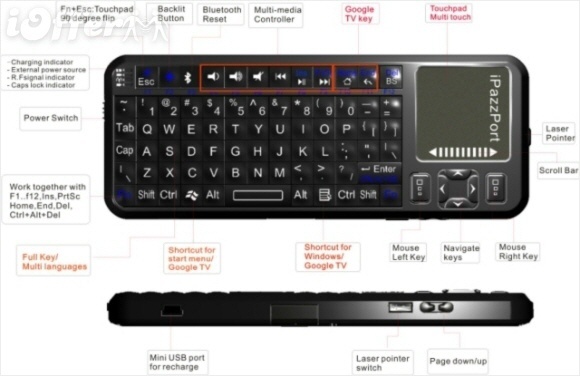 You will have fun scrolling in lists and zapping through TV channels. 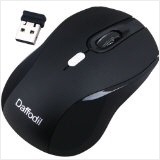 Simply take your bluetooth or wireless mouse you are using with your PC or laptop. Wireless mice are everywhere available for 5 - 10 euros. 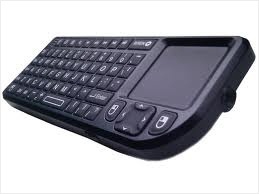 Keyboards with gyroscopic mouse. The cursor is moved by moving and rotating them. Android boxes are full computers with free office Apps for word processing, table calculation, etc. Accordingly, there is a big choice of keyboards. Also high-quality games function very well and quickly. Hence, there are also many joysticks and game input devices. 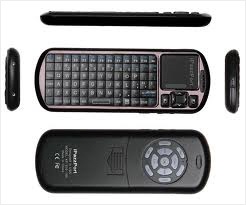 These devices should be tested especially for Android because they work or don't work depending on model. We will shortly present a list of the additional devices recommended by other users here. DVD Player & Brenner. We have found up to now only the DVD recorder of Samsung (SE-218BB) (approx. 50€). It should support Android. Indeed, there are contradictory user's experiences here. We would like to hear feedback about your experiences.